I am in a One Sheet Wonder club run by Jessica Taylor and each month she gives us a new template to use. These are the cards I made today using this month's template. 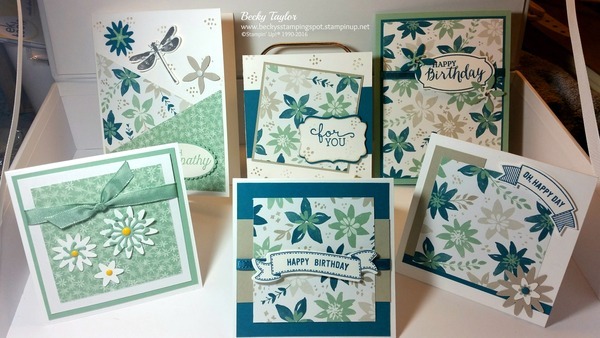 I love the Blooms & Bliss Designer Series paper, especially the blue and green sheets. This paper's colors are Island Indigo, Mint Macaron, and Sahara Sand. I punched out flowers using the Blossom Bunch Punch, Flower Fair dies, and Botanical Builder Framelits. 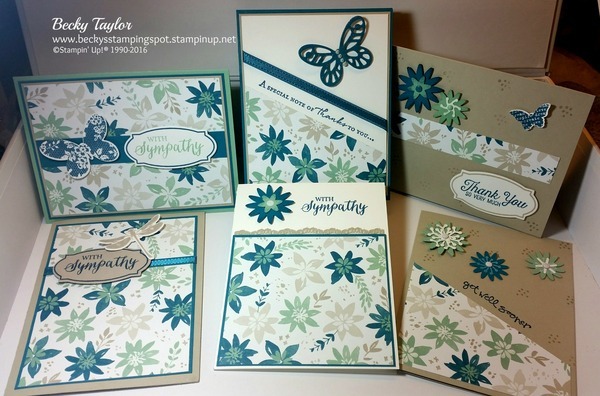 Various stamp sets were used for the sentiments and embellishments: Greatest Greetings, Awesomely Artistic, Flourishing Phrases, Birthday Blooms, Rose Wonder, Thoughtful Banners, Birthday Banners for, and Floral Phrases. 4 of the cards are 4x4 cards for gift enclosures. I also used the Layering Ovals framelits, Rose Garden framelits, Butterflies Thinlits, and Bitty Butterfly punch. One Sheet Wonders are a great way to make a bunch of cards using only 1 sheet of 12 x 12 Designer Paper (or paper you stamp yourself). If you like to hoard your pretty papers (like I tend to do), this is a great way to make cards without using a lot of the pretty paper. I got 10 cards out of that one sheet!